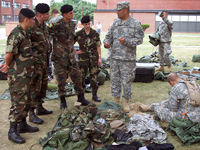 Albanian Soldiers observing a Military Police platoon sergeant mobilizing at Fort Dix. Pictured (l-r) Sgt. Llir Nanaj, Capt. Elton Bregu, Lt. Gazmir Pepa and Sgt. 1st Class Alketa Ktona. Photo by Master Sgt. Joseph V. Tatem, JFHQ-NJ. The National Guard State Partnership Program (SPP) started in 1993 with the demise of communism and the Soviet Union. SPP links states with partner countries; hence, the partnership of New Jersey and the Republic of Albania. Because we are the National Guard, we offer civilian-military expertise distinguishing ourselves from the active Armed Forces. Soldiers and Airmen apply both military and civilian skills to foster democracy, encourage economic development and promote regional cooperation and stability. For four weeks this summer, four groups from the Albanian Armed Forces received familiarization in their fields and experienced very profound cultural exchanges. The majority of these visitors had never been to the United States and a few had never even been out of their country. The first group was from the Albanian Air Force, which has recently transitioned from fixed wing to rotary wing aircraft, has observation and utility Helicopters. Their focus was on aircraft maintenance. These Maintenance Officers were hosted by Col. Jorge Martinez and the staff of the Aviation Flight Facility in West Trenton. In an e-mail to the Albanian Air Force Executive Officer Martinez writes "It was very pleasing and rewarding how our professionals communicated and got along. Lt. Col. John Scannell's team was very impressed with their (Albanian) counterparts and truly enjoyed having spent the time showing our facilities, records and procedures. Most important, our fellow soldiers did an outstanding job in addressing current issues with an eye on the future of our programs." The second group was hosted by Col. Jim Grant and the staff of the National Guard Joint Training and Training Development Center. This event focused on Tactical Operations Center Simulations. Lt. Col. Hysen Hoxhalli, Albanian Army General Staff, Planning Directorate, sent a thank you e-mail that reads in part, "We had a lot of discussions, open ideas and sharing experiences. We felt ourselves like at home during those days...We recognize your contribution and the support of the whole National Guard of N.J. as a twin Army of the Albanian Armed Forces.We do believe that your experience and your achievements will help us in designing similar facilities, techniques and procedures for training our units." It was also mentioned that their visit to Ground Zero was most memorable and will remain in their hearts. The third group was from Albania's Rapid Reaction Brigade (RRB), which is the nucleus of Albania's land forces, and was hosted by Lt. Col. Nick Chimienti and the soldiers of the 2nd Battalion, 113th Infantry. The Albanian team observed air mobile training and infantry lanes training which included company attack. Lanes are designed to assist in developing, sustaining, and evaluating a unit's mission proficiency. They are also paramount to the success of the RRB's mission. Chimienti made these three officers honorary Soldiers of the 113th and presented them with regimental crossed-rifles and the battalion crest. The fourth group was co-hosted by State Command Sgt. Maj. Jerome Jenkins and Master Sgt. Joe Tatem of the Army Guard's Operations and Training Directorate. This event focused on Senior Non-Commissioned Officer duties and responsibilities. The primary objective for Albania's NCO ranks is to produce a professional, Western-type NCO Corps that can assume more responsibility in the dayto- day operations. The event used subject matter experts ranging from the Judge Advocate General, Training, Logistics, Surface Maintenance, Antiterrorism, and Family Support culminating with a discussion with the State CSM. To the Albanians, the State Partnership Program is an opportunity for their military to contribute to coalition operations throughout the region and to become a member of the North Atlantic Treaty Organization. 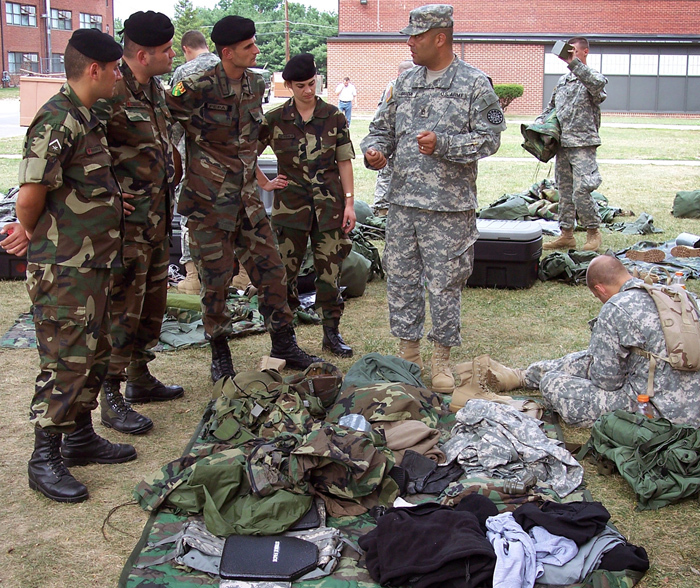 New Jersey National Guard Soldiers and Airmen are Albania's Goodwill Ambassadors. We're not just making history together, we're making a difference.